I have the perfect game day dish that the whole family will enjoy... pizza braid. Fill this with your favorite pizza toppings. I also show you how to make a dessert option. 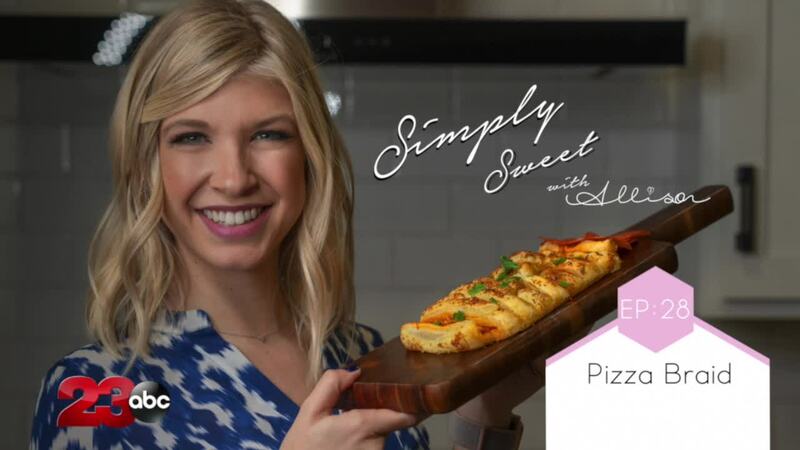 BAKERSFIELD, Calif. — This week on Simply Sweet Allison we are making a pizza braid, which is the perfect game day dish for the big game this weekend. You can fill the pizza braid with your favorite pizza toppings. We also have a dessert option with Nutella and bananas. This is easy to make and only has a few ingredients. Your friends and family are going to love it! Lay out puff pastry sheet. Pour pizza sauce into the center section of the puff pastry, leaving about an inch at the top and bottom. Sprinkle on the cheese in an even layer. Then top with the pepperoni slices. For the dessert brain, spread out the Nutella and top with the banana slices. Next, cut 1-inch slices, on a diagonal, to the left and right of the filling. Cut off the corners, leaving about an inch margin on then ends to fold. Fold down the top margin and begin to fold the left strip, and then the right strip, alternating, until you reach the bottom. Top with the mixture of melted butter, Parmesan and dried oregano. Serve with extra pizza sauce for dipping and top the dessert braid with powdered sugar!